Mr. Hammond's picture shows us how very nobly Nottingham Castle stands up above the surrounding neighbourhood; its cliff is a hundred and thirty-three feet above the Boulevard, and its commanding crags always seem to challenge the skill of the rock climber. Just to the left of the Castle, in this picture, is shown the site of the 'Papist Holes' which are now enclosed within the gardens of 'The Hermitage', on Castle Boulevard. These caverns have given rise to all sorts of theories as to their origin and use. Nothing is very definitely known about them beyond the fact that in the middle ages they were undoubtedly the resort and dwelling-place of certain devotees, for they were spoken of as the Chapel of St. Mary in the Rocks. The river Leen, which runs across these meadows, has rather an interesting history. Up to the time of the Conquest it joined the Trent near Lenton, and some traces of its old bed may still be found on the western side of Trent Lane. However, William Peverel wanted water power to turn his mill and for domestic purposes at the Castle, so he formed a fresh course for the river across the Meadows, causing the stream to flow more or less where the present Boulevard runs. 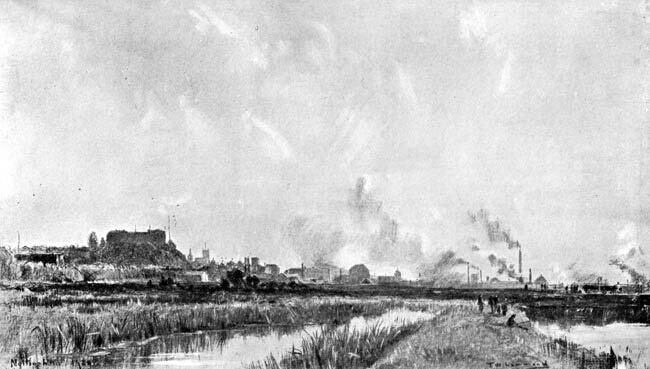 The water turned his mill at the foot of the Castle Rock, and then was passed along and joined the Trent below Trent Bridge. On these Meadows were encamped in the year 1487 the army of Henry VII. which on the day following marched forth to the battle of Stoke where they overthrew the adherents of Lambert Simnel.